Automobile Giants General Motors, Ford, BMW, and Renault have now collaborated together to form a new group to explore the potential of the blockchain in the automotive and mobility space. MOBI — the Mobility Open Blockchain Initiative has over 30 founding members that also includes IBM, Bosch, Hyperledger, and IOTA with a goal of making transportation "safer, more affordable, and more widely accessible using blockchain technology." The blockchain has obvious potential to impact a range of industries. The now trademark distributed ledger component and smart contracts, in particular, could rearrange the way organizations and products use, consume and publish data. MOBI's focus is on payments, data tracking, and supply management, to consumer finance and pricing, and more futuristic areas like autonomous vehicles and ride-sharing systems. MOBI isn’t the first time automotive firms have looked ways to implement blockchain. Daimler is part of the Hyperledger project from the Linux Foundation, Toyota is already doing its own research, and Renault has joined the R3 research consortium. With MOBI, the group is now focusing entirely on the automotive space and potential use cases rather than automotive as one of a number of industries. 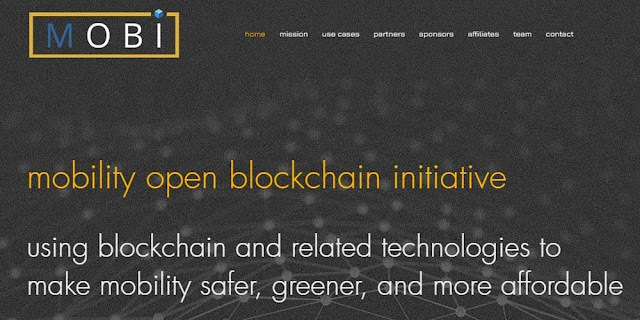 Through an open-source approach to blockchain software tools and standards, the MOBI consortium says it hopes to stimulate more rapid and scalable adoption of the technology – by companies that are developing autonomous vehicle or mobility services, for example. MOBI plans to connect global mobility providers with blockchain innovators, as well as government/non-government agencies and other institutions, to collaborate on the development of blockchain-enabled vehicle data and mobility services. The organization said that its partners "seek to foster an ecosystem where businesses and consumers have security and sovereignty over their driving data, manage ride-share and car-share transactions, and store vehicle identity and usage information." "Blockchain and related trust enhancing technologies are poised to redefine the automotive industry and how consumers purchase, insure and use vehicles," Chris Ballinger, who is MOBI’s first chairman and CEO, said in a statement. "By bringing together automakers, suppliers, startups, and government agencies, we can accelerate adoption for the benefit of businesses, consumers, and communities," added Ballinger, who was formerly CFO and director of mobility services at the Toyota Research Institute. Members of the organization’s board include Joseph Lubin, founder of ConsenSys and a co-founder of Ethereum, and Brian Behlendorf, executive director of Hyperledger. Accenture; Aioi Nissay Dowa Insurance Services USA; Beyond Protocol Inc; BigchainDB; Blockchain at Berkeley; BMW; Bosch; Chronicled; ConsenSys Systems; Context Labs, Crypto Valley Association; Dashride; Deon Digital AG; Digital Twin Labs; DOVU; Fetch.ai; FOAM; Ford; General Motors; Hyperledger; IBM, the IOTA Foundation; Luxoft; MotionWerk; NuCypher; Oaken Innovations; Ocean Protocol; Outlier Ventures; Renault; Ride Austin; Shareing; Shift, Spherical Analytics; the Trusted IoT Alliance; VeChain; Xain; and ZF Friedrichshafen AG. Usage-based mobility pricing, and payments for vehicles, insurance, energy, congestion, pollution, and infrastructure.